Find out how to handle your TMJ-related symptoms for good. Over-the-counter pain medications: If you are experiencing some pain or discomfort, your Alexandria, VA dentist recommends taking an OTC pain reliever or anti-inflammatory to help reduce your pesky symptoms. Most patients find the relief they need with these non-prescription medications; however, if your pain does become worse talk to us about a prescription-strength pain medication that could help eliminate your TMJ pain. Muscle relaxants: Sometimes your family dentist in Alexandria may also prescribe muscle relaxants for a couple of days to a few weeks to help reduce jaw pain. Icing: Don’t ever ignore the power of icing. Just as you would ice sore muscles you can also ice the areas of your jaw that are causing your problems. Icing for no more than 15 to 20 minutes at a time a couple times throughout one day should be enough to alleviate some of the discomfort. Changing your diet: While no one likes to hear this, sometimes saying goodbye to harder, more difficult foods to chew might just save those aching jaw muscles. Instead, opt for a diet rich in softer foods like yogurt, eggs, and lean proteins. We also recommend avoiding chewing gum, which can stretch and aggravate jaw muscles. However, there comes a time when your TMJ symptoms are just too uncomfortable and frustrating and you need a little help from your Alexandria family dentist. That’s when we will recommend a dental splint, also referred to as a bite guard. This oral appliance goes over your teeth to not only keep them in alignment but to prevent painful tooth grinding while you are asleep. Bite guards are a great way to protect teeth from the wear and tear of TMJ grinding and to keep symptoms at bay. 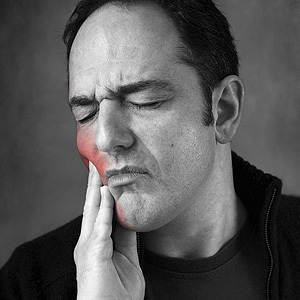 If you are interested in finding out more about a bite guard to alleviate your TMJ problems, then it’s time to schedule an appointment with your Alexandria, VA family dentist, Dr. Paul Gibberman at Gibberman Dental.